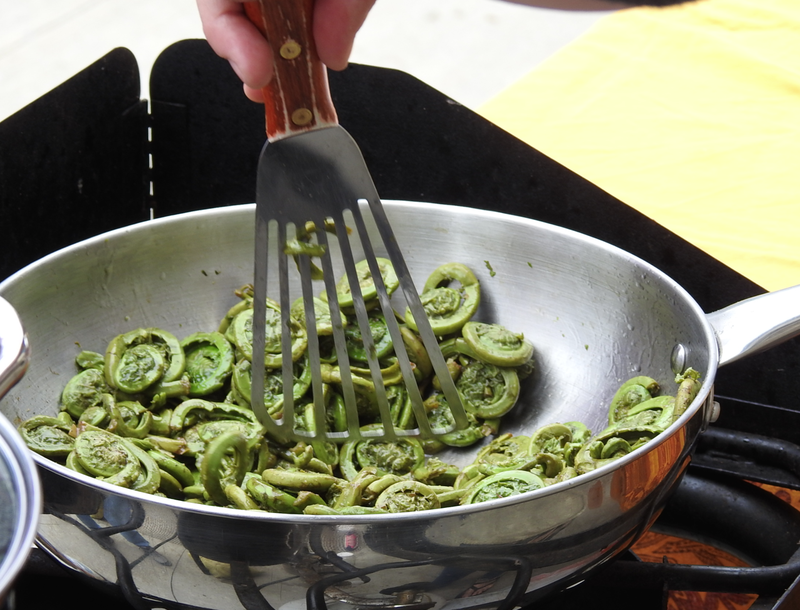 The Maine Fiddlehead Festival returns to the University of Maine at Farmington campus on May 4, 2019. 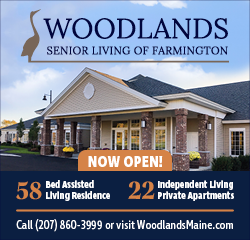 FARMINGTON - The Maine Fiddlehead Festival, now in its 8th year, is back by popular demand with a new location and theme. The celebration of local food and agriculture will take place on Saturday, May 4, from 10 a.m. to 3 p.m. on the campus of the University of Maine at Farmington. At a new location along High Street, between the UMF Student Center and Roberts Learning Center, the free festival will again sport live music, demonstration talks, live farm animals, the season’s first outdoor farmers market, food trucks, gourmet fiddlehead cooking demos and more. Planners hope that more convenient parking will attract a bigger crowd than in past years. State Sen. Russell Black is expected to deliver opening remarks this year at 10 a.m. to start the festivities. Black is a farmer who is known for his support of local food and environmental issues. At last year's festival. This year, events will move down High Street toward the Roberts Learning Center. In addition to the annual performance of the popular Franklin County Fiddlers, other local musicians, including Invite the Wild, Crooked Bill, The Merry Plinksters and others, will furnish live music in the hillside amphitheater. A permaculture sheet-composting demonstration will be conducted around heirloom apple trees. Antique tractors are expected to be on display. 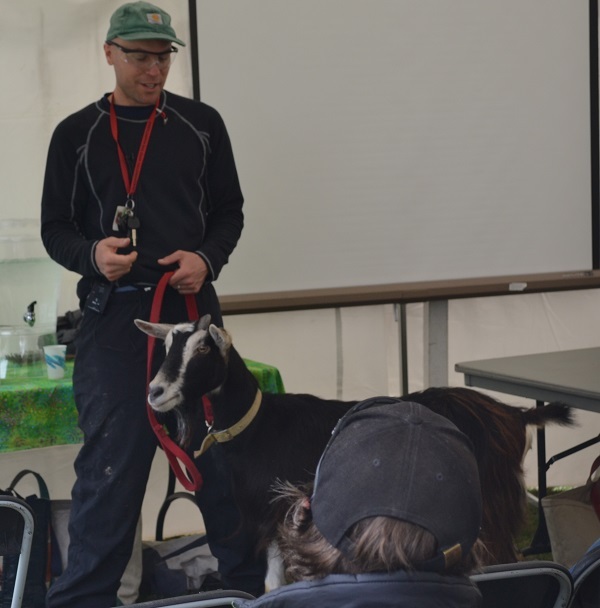 Jordan Kimball describes the care of goats during a previous festival's tent talk. This year's theme is fermentation. Tent Talks will highlight the traditional uses of fermentation in preserving and enhancing foods and liquids, with demonstrations of sauerkraut, yogurt, sourdough, kombucha, aged goat cheese and koji, the staple of Japanese ferments such as soy sauce and miso. A presentation by Mainiacal Yeast Labs will explore the history and science of fermented foods and drinks in cultures world-wide. In keeping with tradition, the UMaine Cooperative Extension will give a talk about fiddlehead identification, safe handling and sustainable harvesting, followed by a walk to see if the fiddleheads are up yet. 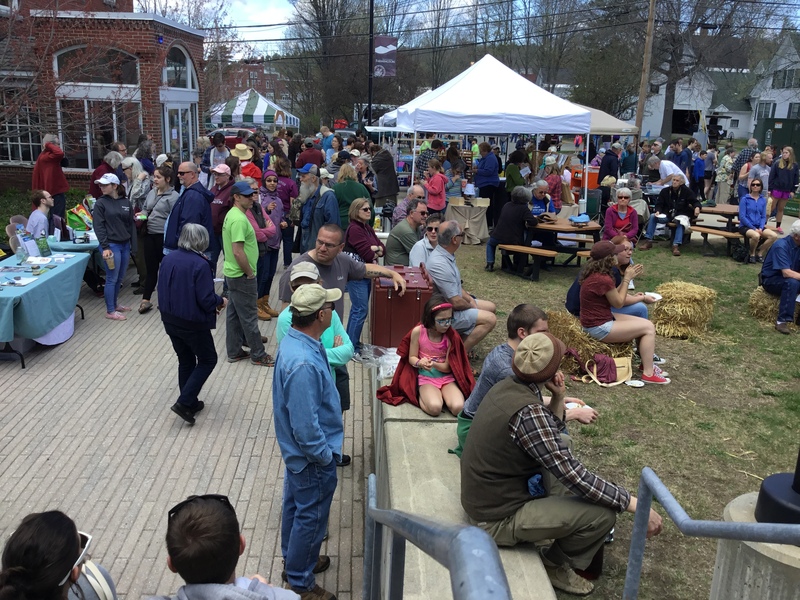 The Maine Fiddlehead Festival is organized annually by a coalition of volunteers from the surrounding communities and the UMF Sustainable Campus Coalition. It grew out of decades of local food promotion efforts by area farmers, food activists, and college faculty, and was conceived as an opportunity to celebrate the bounty of food, both farmed and foraged, in the Franklin County area. Since 2011, the family-friendly festival has gained popularity each year, compelling the move to a new venue. The late arrival of spring does not intimidate the planners of this year's event. So far, organizers say, they've always been able to have some fiddleheads on hand, even if they weren't locally gathered. With or without the emergence of fiddleheads on local stream banks in early May, the show will go on. For more information, visit Mainefiddleheadfestival.com or the Maine Fiddlehead Festival Facebook page.